The above forex signal has been given ahead of FOMC statement and press conference. During news announcement, the order has activated and made +95 PIPs profit till now. We trade on AUDUSD as I found some effective relation for expected movement in this pair. This trade gave us +95PIPs profit. Usually, news trading profit facilitates us to count big PIPs. Such as during the last ECB Press release on 3rd December – 2015 we made +170PIPs from two trades in a very short time. Pending order Buy NZDUSD from 0.6578 SL 0.6480 TP 0.6660, 0.6710, 0.6750. This is also true big profit also come from the normal trading day such as last week we made +155 PIPs profit from GBPUSD selling it was a long term forex trading signal send as a pending order on Friday it was staying over the week needs 3/4 days to make this profit. For such trade needs as much time to see profit comparatively news trading style. To sustain in the forex market needs some dependable forex news trading strategy and need to utilize chances as per market is given. 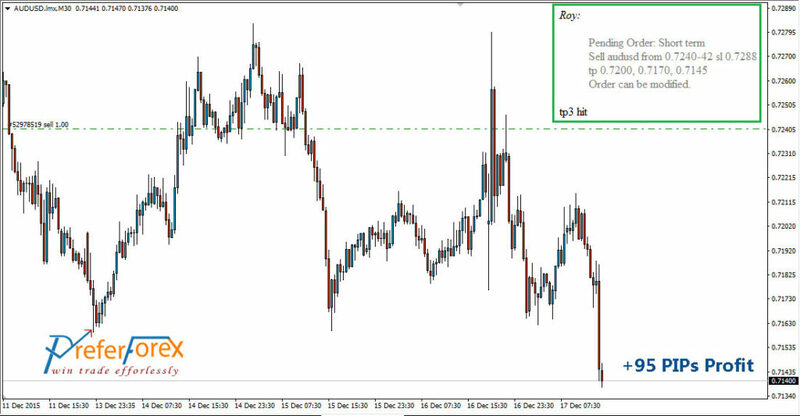 With some fabulous trade of the month of December’15, we made as of today +406 PIPs that nicely valued our yearly gain. Forex trading environment always may not in trader’s favor but market knowledge good strategy help us to make a consistent profit that is the key to success in the trading arena. Best of luck and enjoy the upcoming atmosphere of the year ending festivals.